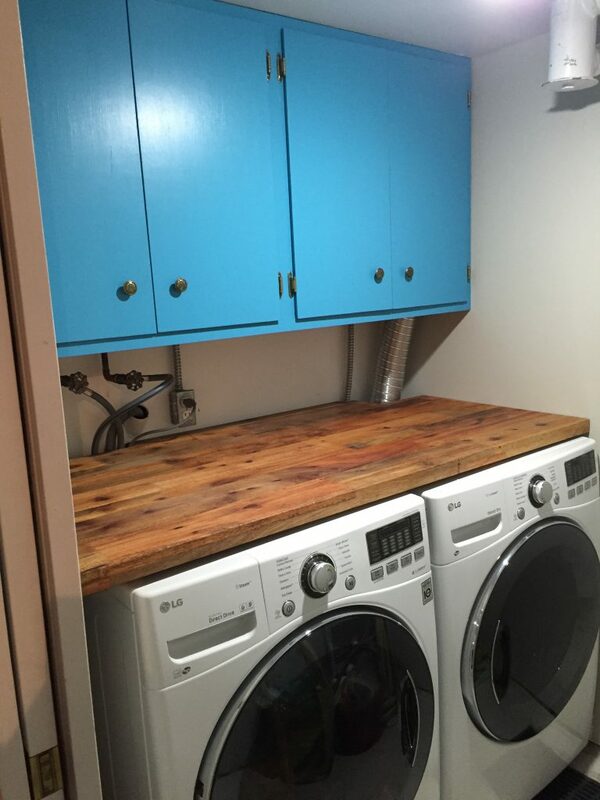 Initially, we thought we’d stack the washer & dryer, but realized that they’re both front-loading machines, and so we could put a countertop above them and have a nice work surface for folding, ironing, etc. Dina and I took Squeaky over to Ballard Reuse and perused their selection of materials. I spied some interesting long boards that turned out to be reclaimed wood from Boeing shipping crates. It was a laminated board 18″ wide, 1.5″ thick, and about 18′ long. Perfect? I cut two 5′ lengths and glued them up side by side to create a counter that would fit in the room and cover the tops of the washer & dryer. 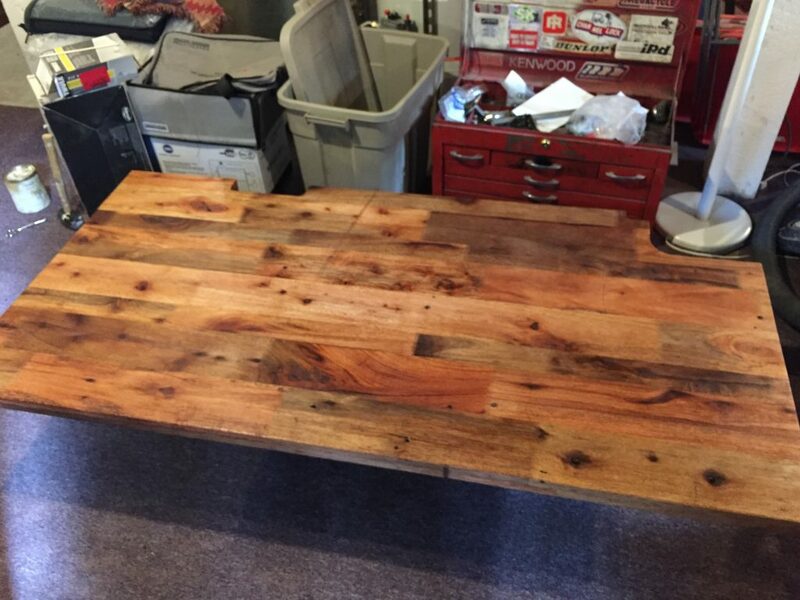 It’s finished with a coat of Tried & True varnish. Installation involved cleats on the walls and then just dropping it in place. Now, on to storage. 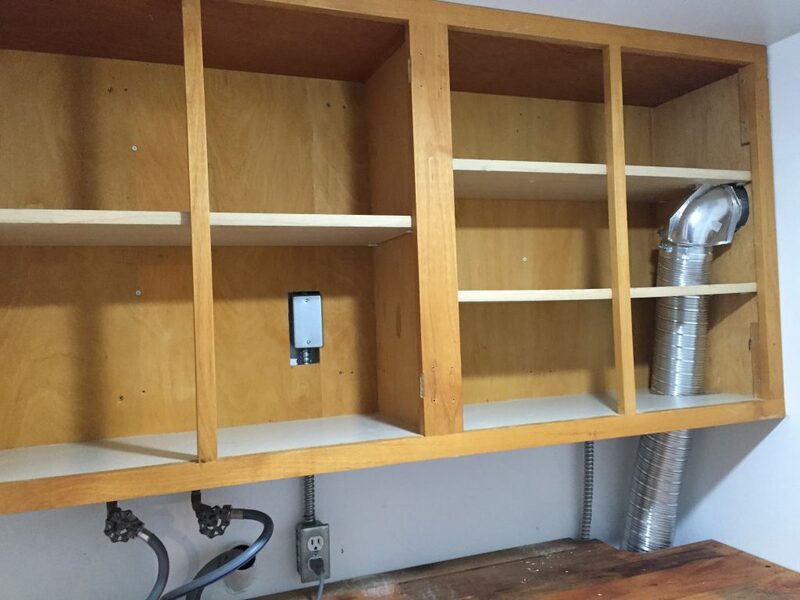 I went back to Ballard Reuse a while later and found an old kitchen cabinet (uppers) that we could mount on the wall to store detergent, other cleaning supplies, etc. 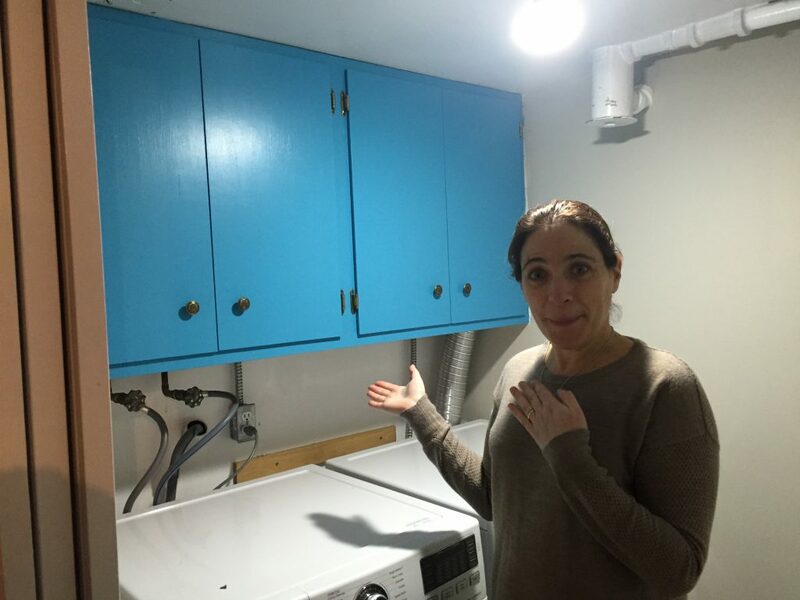 Only one problem: the water supply lines for the washer, along with the power outlet for the washer, were mounted on the wall right where we wanted the cabinet. The harder step (for us) was moving the water supply lines. 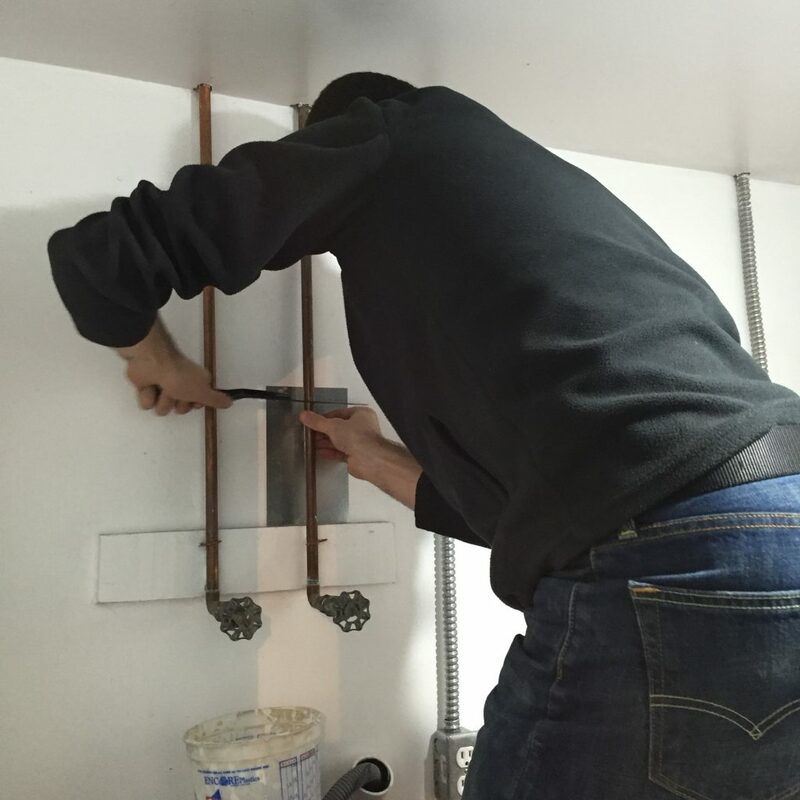 Neither of us had much plumbing experience, but we read a bit and figured we could do it ourselves. 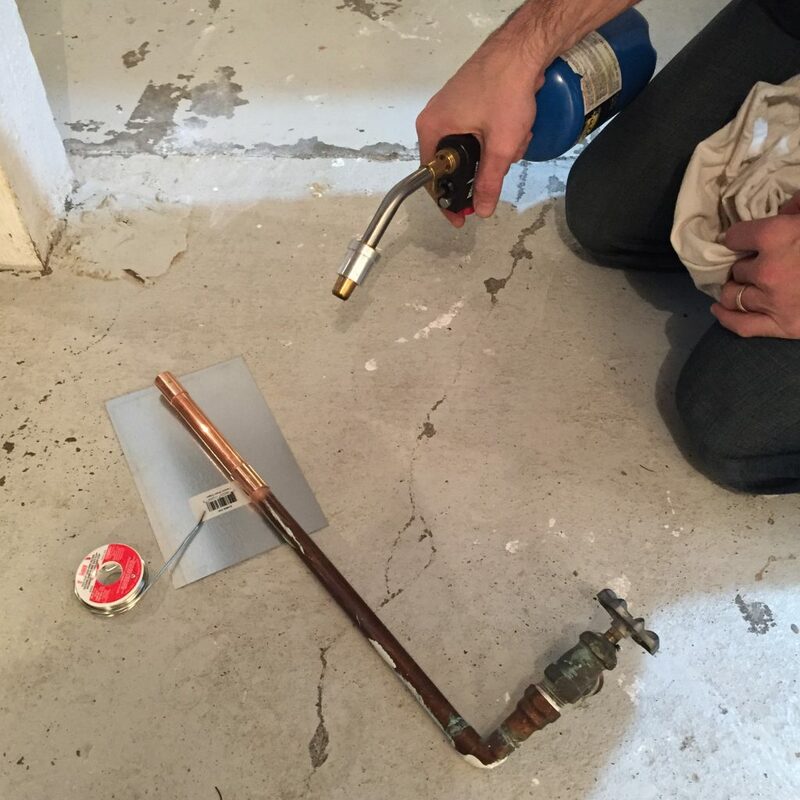 After purchasing copper pipe, some fittings, solder, and flux, we had what we needed. It was Friday afternoon, we were both home, and we had 90 minutes before our dinner reservation. Is there a better time to start a project doing something you’ve never done before? The astute among you may notice a problem with our approach. We figured we’d avoid torching the floor by putting a piece of metal flashing under the work as a heat shield, but failed to consider that the price tag/sticker wouldn’t stand up to the heat so well. Smoke alarms were set off, but no further damage occurred, and that section of pipe went together perfectly. 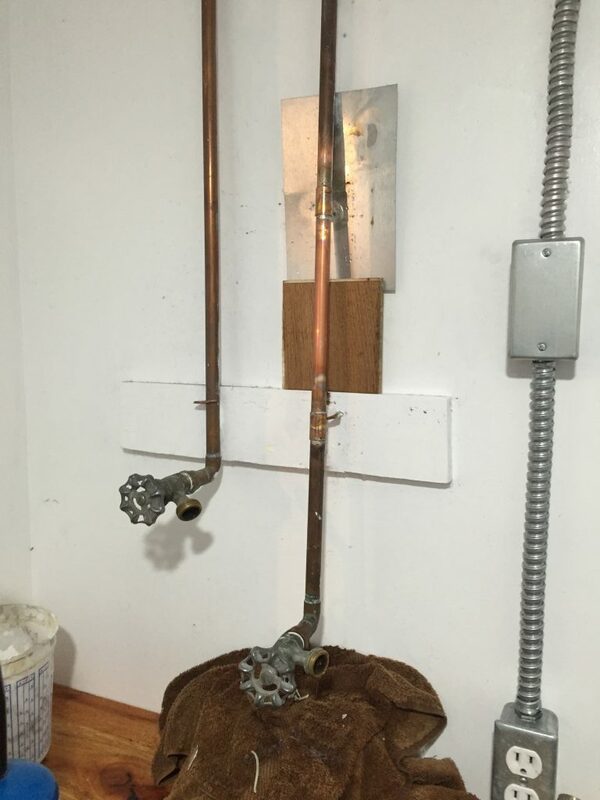 However, when we tried to solder that extended faucet back on to the main pipe, things went a little less smoothly. 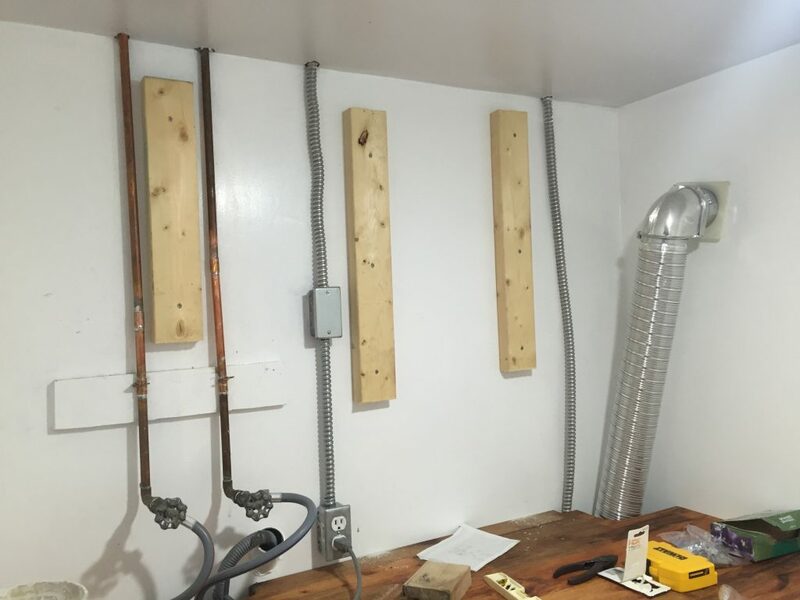 It was pretty tricky to get a heat shield between the pipe and the drywall, and (as I eventually learned) I was being a little too stingy with the torch. The longer run of pipe (both above and below) acted as a heat sink, and sucked the heat away from the joint, so a couple of times, I gave up soldering before the joint was fully sealed. Unable to finish soldering (because the flux was no longer working) or pull the joint apart (because I wasn’t giving it enough heat), we just cut the pipe off and started again. So for a while, the pipe kept getting shorter instead of longer. Eventually, we figured it out, and after changing our dinner reservation twice, finished lengthening both pipes. The cabinet was in fine shape, but not particularly attractive, as it was reclaimed from an old kitchen. 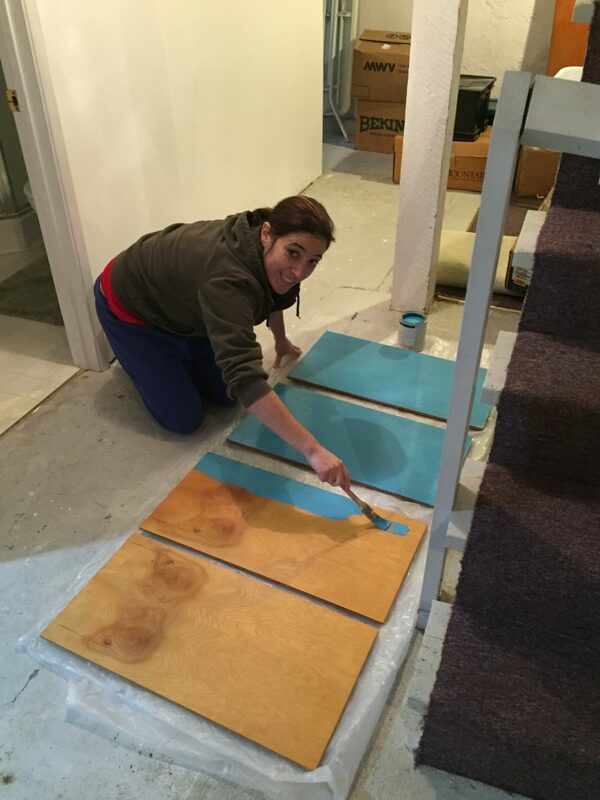 Dina noted that this would be a great place to add some color to an otherwise pretty drab room, so we got some turquoise paint and she went to town.